Today on the blog, I’m very delighted to be sharing with you guys one of the latest wedding albums to leave the studio…this time around featuring Moira & Vinny’s wedding back in 2016, with the ceremony taking place at Glasgow University and then along to the fabulous Seamill Hydro for the reception. The guys opted for the top of the line “Original Wedding Book” from my lab, Graphistudio. Both the album binding and box were finished in white cloud leather with the album cover itself in the popular “crystal glance” finish. 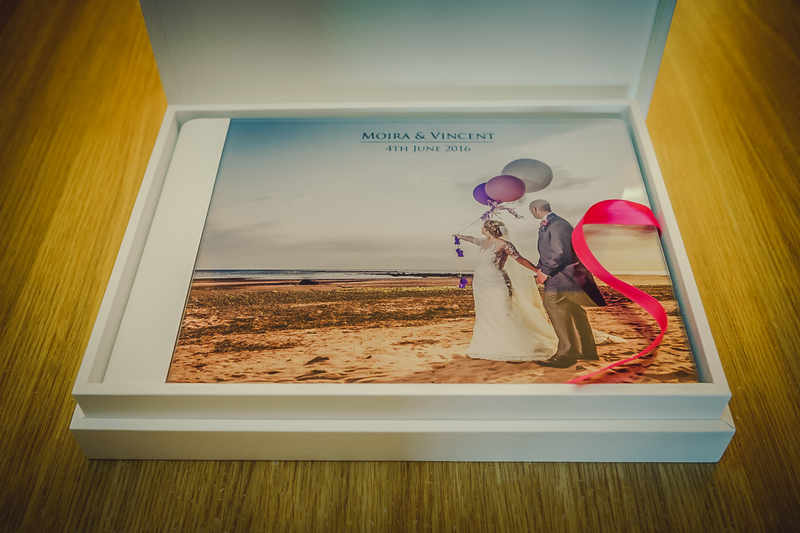 The box was highlighted in my own scroll design in raised and varnished fuchsia, and finally a fuchsia ribbon to match. This one, I am very keen to be sowing you, as not only was it a totally amazing day, but this was also the first of the new Graphistudio “Go Books” that I’d had the honour of pulling together and, as you may have seen from my other pages in this site, I’m now delighted to be including the Go Book as standard with my very popular Primo wedding collection :-). Today on the blog, I’m very delighted to be sharing with you guys one of the latest wedding albums to leave the studio…this time around featuring Jacqueline & Bryan’s wedding at the Bay Hotel last August. For their album, the guys chose one of Graphistudio’s very stylish “Young Books” with a huge 60 pages. 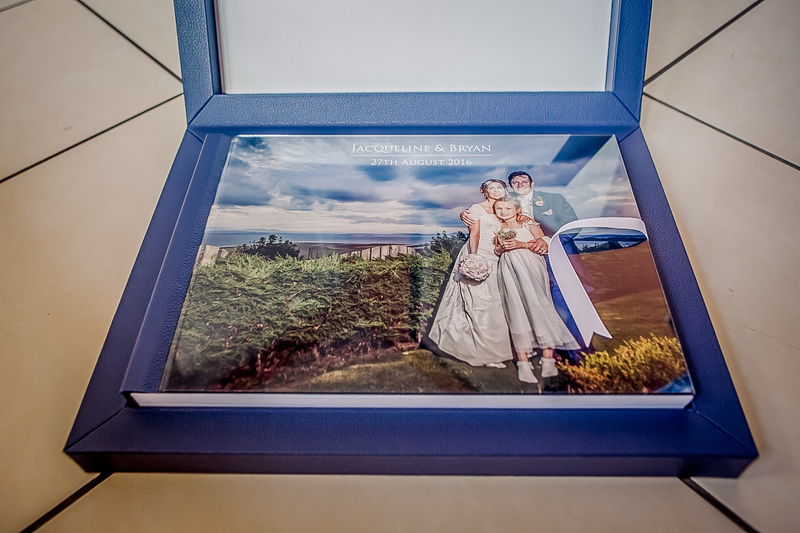 Jacqueline & Bryan opted for the popular “crystal glance” cover, bound in a dark blue leather binding. This was all topped off with my own design for the box with a light grey scroll design raised and varnished over a dark blue leather box to complement the album binding, and all finished off with a white ribbon. It’s been a while since I shared a new album design with you guys, so very pleased today to be putting that right! And, bizarrely, as per my last post, it’s yet another wedding at the fabulous Sherbrooke Castle Hotel, this time around, featuring Sarah & Ross’s big day from May last year. 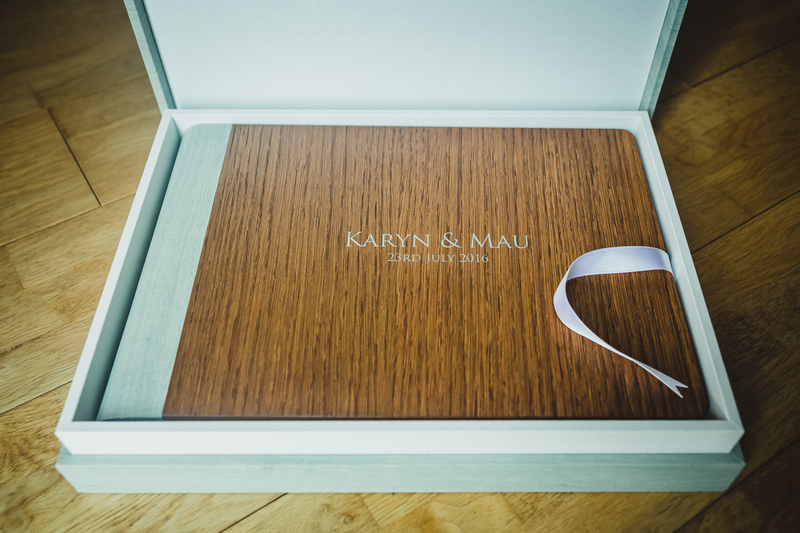 For their album, the guys chose one of Graphistudio’s “Original Wedding Books” with a huge 60 pages. 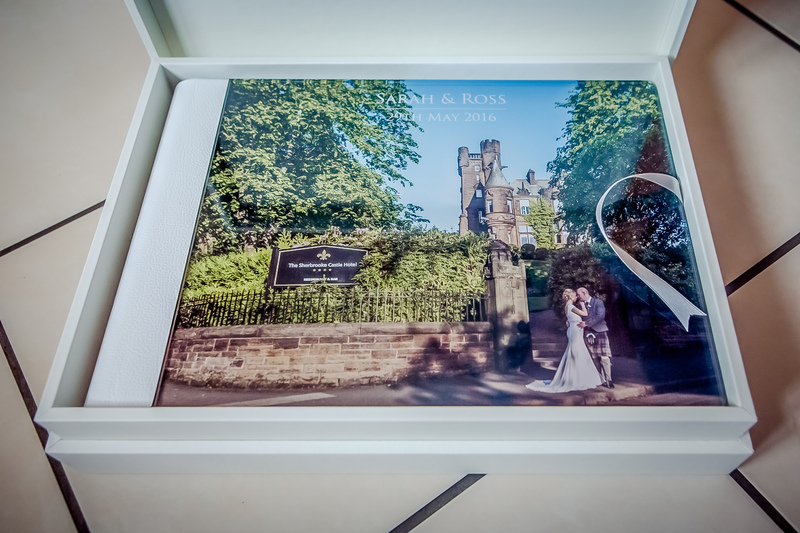 Sarah & Ross opted for the popular “crystal glance” cover, bound in a white leather binding. 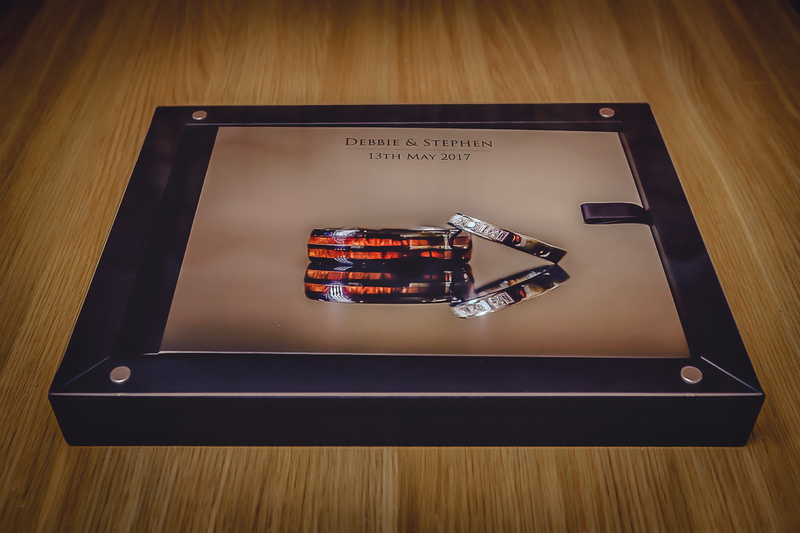 This was all topped off with my own design for the box with a grey scroll design raised and varnished over a white leather box to complement the album binding – who says albums are dead and buried! The pages of the album were finished in my own finish of choice – metallic with satin lamination :-). It’s been a while since I shared a new album design with you guys, so very pleased today to be putting that right! Karyn & Mau were married last July at St. Alexander’s Church in Denny before heading up to the fabulous Dunblane Hydro for their reception. For their album, the guys chose one of Graphistudio’s “Original Wedding Books” with a huge 60 pages. The guys chose the brown oak wood cover (the first time I’d seen this and it looked great), bound in a sage grey maple binding. This was all topped off with my own design for the box with a dark grey scroll design raised and varnished over a sage grey maple box to complement the album binding – who says albums are dead and buried!